A team of Canadian, US and Japanese scientists turned to baker’s yeast in a hunt for better drugs. One of the hardest parts in drug discovery is pinning down how a medicine actually works in the body. It took nearly 100 years to uncover the molecular target of aspirin, but even with cutting-edge technology, it can take years to untangle how drugs interfere with cells. And yet, to develop medicines that target disease effectively and are safe —with no side effects—these molecular insights are key. 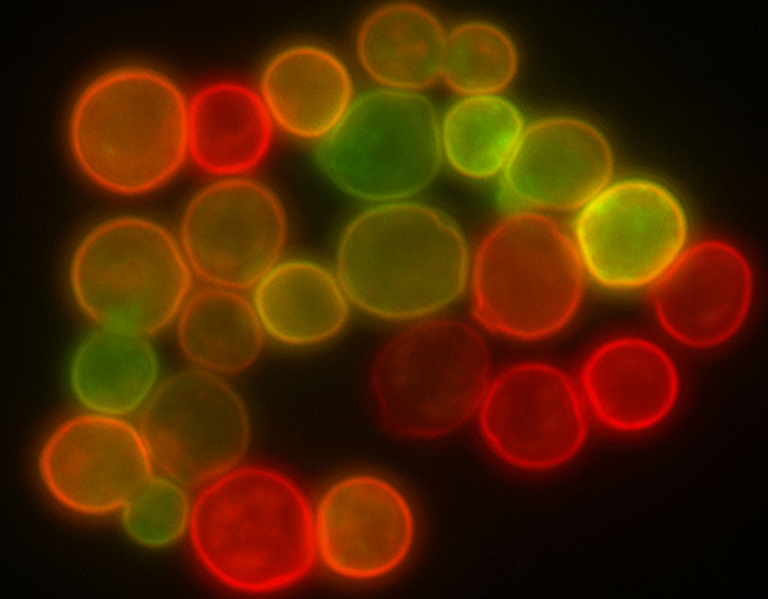 Now a new method developed by U of T researchers and international collaborators has the potential to accelerate target discovery with help from yeast cells, which are a simpler version of human cells but far better known at the molecular level. Teams led by Professors Charles Boone, a professor of molecular genetics in U of T’s Donnelly Centre, Chad Myers, of the University of Minnesota-Twin Cities, and Professors Minoru Yoshida and Hiroyuki Osada, from the RIKEN Centre for Sustainable Resource Science in Japan, developed a new chemical genetics approach to link a drug to a cellular process it acts on. Boone and Myers are also fellows at the Canadian Institute for Advanced Research, where Boone is a Senior Fellow and co-Director of the Genetics Networks program. The study, published today in the journal Nature Chemical Biology, tested how nearly 14,000 compounds, hundreds of which were previously unexplored, affect basic cellular processes to alert drug makers towards chemicals that are most likely to target a particular disease. The data pointed to ~1000 chemicals, many of which are natural products derived from soil microbes, as a rich source of potential medicines against a range of diseases, from infections, to Alzheimer’s and cancer. Despite modern technology, drug discovery still largely rests on guesswork. To find a drug that, say, kills cancer cells, scientists sift through libraries containing thousands of chemical compounds, the majority of which will have no effect at all. “There are many different types of libraries to choose from. A lot of the time you choose a library based on its availability or its cost, not any sort of functional information, and so it becomes a shot in the dark,” says Dr. Jeff Piotrowski, a lead author on the paper who was a postdoctoral fellow in both the Yoshida and Boone labs and now works at the Boston biotechnology company, Yumanity Therapeutics, which uses yeast cells to find drugs for neurodegenerative diseases. With their chemical genetics platform, Piotrowski and colleagues were able to show which parts of the cell are targeted by thousands of compounds from seven different libraries, six of which have been extensively explored and include collections from the U.S. National Cancer Institute, the National Institute of Health and the pharmaceutical company Glaxo-Smith-Kline. The seventh and largest collection, from RIKEN in Japan, harbors thousands of virtually unexplored natural products from soil microbes. Yeasts are currently the only living organism in which scientists have a good handle on the basic cellular processes, such as DNA replication and repair, energy production, and transport of cargo molecules, allowing them to link a drug to a particular bioprocess. “By annotating these libraries, we can tell which library targets which bioprocess in the cell. It gives us a head start on linking a compound to a target, which is perhaps the most challenging part of drug discovery,” says Piotrowski. The top map (left) shows how thousands of genes interact in yeast cells to orchestrate cellular life. 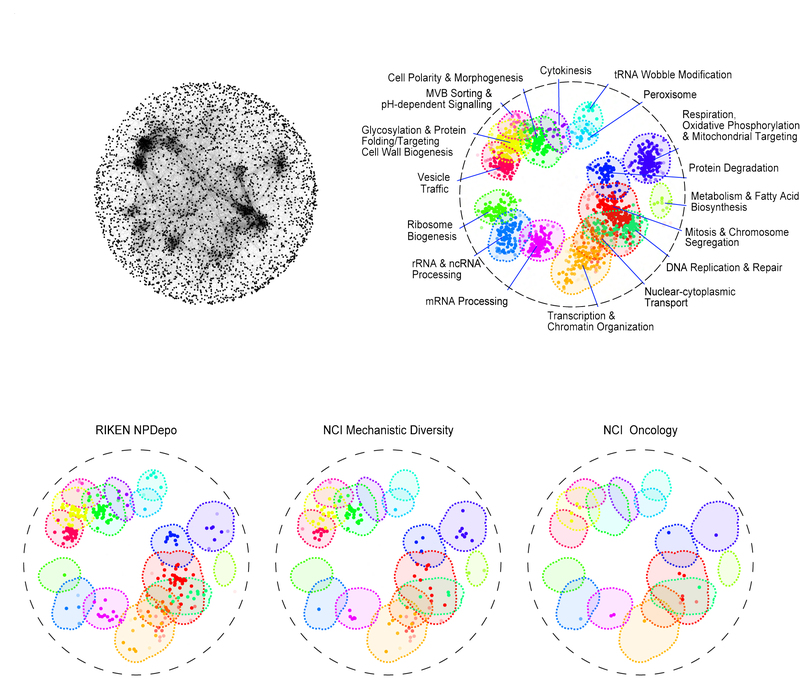 On the right are shown 17 basic bioprocesses in different colours where dots represent the most important genes involved. The bottom maps were created by linking a chemical compound to a bioprocess, telling drug makers where to look for drugs that are most likely to target a specific disease. For example, the RIKEN library has more potential anti-cancer compounds (under “Mitosis and Chromosome Segregation” in red and “DNA Replication & Repair” in mint green) than other libraries. The data revealed, for example, that the RIKEN library contains compounds that act in many different ways: from microbe-fighting chemicals that could be used to treat infections, to drugs that target cellular trafficking that is implicated in Alzheimer’s and Parkinson’s diseases, to those that interfere with cell replication and might be used against cancer. In fact, the RIKEN library turned out to have many novel compounds with anticancer potential. “It’s long been thought that natural products are more functionally diverse, that they can do more things than purely synthetized compounds and that certainly seems to be true from our data,” says Boone. And because natural compounds were shaped by evolution to act on living organisms, they are better candidates for future medicines than synthetic compounds that often do not even get into the cells. It' not surprising then that from aspirin to penicillin, to the blockbuster cancer drug taxol, some of our best medicines we have come from nature. The data also revealed chemicals that influence more than one process in the cell. These compounds are more likely to cause side effects and are best avoided. “With our map, we can see these promiscuous compounds earlier and focus on the good ones,” says Piotrowski. The study was possible thanks to an earlier work by Boone, Myers, and Donnelly Centre Director Brenda Andrews, that mapped out how thousands of genes interact with each other to drive fundamental processes in the cell. The basic premise here was that removing one gene might not do anything because there’s a backup system in place, but removing two genes leads to a profound effect. It’s a bit like playing pick-up sticks where removing one stick at a time has no effect, but removing two together brings the pile down, or makes it stronger. Instead of looking at double mutants, the present study measured how single mutants combined with drugs to influence the cells’ wellbeing. This then allowed researchers to identify which bioprocess is affected by a particular drug, thereby identifying the drug’s mode of action. The beauty of the system employed by this international, multidisciplinary research team was that it integrates all genes within the same assay to assess the behavior of the entire genome in response to a particular drug in one experiment.